Plastic is often used as packaging material. It keeps food fresh, preserves the taste, simplifies transport, protects against contamination and is also light, which keeps fuel consumption low during transport. Since the 1950s, enormous quantities of plastics have been produced, and the trend is upwards. Of the 5.2 million tonnes of plastic waste generated by end consumers in Germany in 2015, over 60% was packaging. Packaging consumption (including other materials) in Germany reached a new high of 18.1 million tonnes in 2016, the same as in the previous year, as reported by the Federal Environment Agency (UBA). The reasons for this are more single households and smaller packaging sizes, the trend towards to-go and convenience packaging and the expansion of online trading. The problem here is that plastic is durable and often ends up in the environment – even in Germany, as waste collection campaigns show over and over again. According to UBA estimates, a plastic bottle takes several centuries to decompose in the ocean. Possible environmental consequences of microplastics are currently the subject of heated debate. In addition, various chemicals can migrate from packaging to food. So what needs to be done? Prohibit plastic? Replace with other materials? Paper, plastic, bioplastics – What is better? Paper has a better image than plastic. It is a renewable raw material that is easily degradable. But paper is not necessarily more ecological than plastic, because its production requires a lot of energy, water and environmentally harmful chemicals. There is also the question of whether it is sustainably grown wood. In a life cycle assessment carried out by Deutsche Umwelthilfe, for example, the paper bag does worse than the recycled plastic bag. Using paper instead of plastic can also shift problems by, for example, transferring toxic mineral oil compounds from the printing inks in the paper to the food (see Knack-Punkt 4/2017, p. 14f). Bioplastics sound like an environmentally friendly plastic variant, but they have nothing to do with “bio” as we know it from the food sector. It is important to differentiate what is actually being talked about. If it is a biodegradable plastic, it only makes sense for certain applications, for example in agriculture, where the films remain on the field. However, biodegradable plastics are only degraded under certain conditions, in particular in industrial composting plants. The fact that they simply dissolve in the environment is a misconception. When it comes to biobased plastics, they are no better than conventional plastics. In some cases even larger quantities of additives are added to them in order to achieve the desired material properties. Renewable raw materials such as maize or sugar cane compete with food production and usually require extensive use of fertilizers and pesticides. The vegetable raw materials for the most widely used biodegradable plastic PLA (polylactides) often originate from genetically modified maize. Moreover, the recycling processes are not yet fully developed and the quantities on the market are so small that it is not (yet) worthwhile to set up appropriate collection and recycling systems. Even though life cycle assessments should take a close look at what assumptions have been made, they usually show that the useful life is more relevant than the type of material. But what are obstacles to the reuse of packaging? In most studies, reusable systems perform better than disposable systems. Although glass bottles can be reused up to 50 times and reusable PET bottles only 25 times, in a study by the Institute für Energie- und Umweltforschung in Heidelberg (ifeu) the plastic bottle performs better than glass bottles due to its lower weight and lower energy consumption for production. Nevertheless, the reusable glass bottle remains superior to the disposable PET bottle. Yet discounters have flooded the market with disposable bottles, and the returnable rate has fallen massively to 43%. It is important to keep this in mind: Deposit does not mean reusable bottles! The politicians hoped that the introduction of the deposit for non-refillable bottles would lead to an increase in the returnable quota, but the opposite happened. Isabel Kuhl of the Alnatura retail chain emphasizes: “With us, consumers can choose whether they buy their yoghurt in a deposit glass or in a disposable cup. After all, returnable glass is superior to plastic cups up to a transport distance of 200 kilometers. Nevertheless yoghurt is also slightly more expensive in a deposit glass.“ One hurdle is that industry associations or companies must agree on a common reusable system. Reusable systems are often more expensive than disposable systems because reusable systems require additional logistics and cleaning”, explains Kuhl. Discounters do not want to have to maintain additional storage capacity, manufacturers insist on the individual form of packaging for marketing reasons. The new Packaging Act provides for a voluntary increase in the reusable packaging quota to 70 %. However, it remains unclear how this can be achieved without sanctions. 96% of consumers consider it more or less important that less packaging waste is produced, as a survey commissioned by the Federation of German Consumer Organisations (Verbraucherzentrale Bundesverband) showed. Around two-thirds say that they already prefer to buy products in reusable packaging. However, reality shows a different picture and is a question of the social milieu. Only a few regularly go shopping at weekly markets or in unpackaged shops and give up on convenience or to-go products. Most people have not yet become accustomed to carrying a few bags or even a plastic can to have cheese or sausage packed at the counter. For the majority of consumers, it is more likely that they will only change their behaviour if there is no additional effort and if the price does not rise – and if the labelling is right. A study by the Arbeitskreis Mehrweg has shown that 50% of consumers are unable to distinguish between reusable and disposable bottles. A considerable proportion of packaging waste is not produced at home, but already in the supply chain, i.e. in logistics, transport and wholesale. By contrast, many discounters and supermarkets are increasingly offering unpackaged goods, especially fruit and vegetables. For example, Aldi Süd and Aldi Nord use returnable crates instead of disposable containers for transport. Rewe, Edeka and Lidl are also committed to taking measures to reduce packaging or make it more environmentally friendly or recyclable. The media discourse has thus achieved something. Lukas Sattlegger, who researches plastic packaging at the Institute for Social-Ecological Research (ISOE), considers the role of supermarkets and discounters important because they reach the masses: “Just as organic food has established itself in discounters and supermarkets, unpackaged sales could also become the norm in the future. 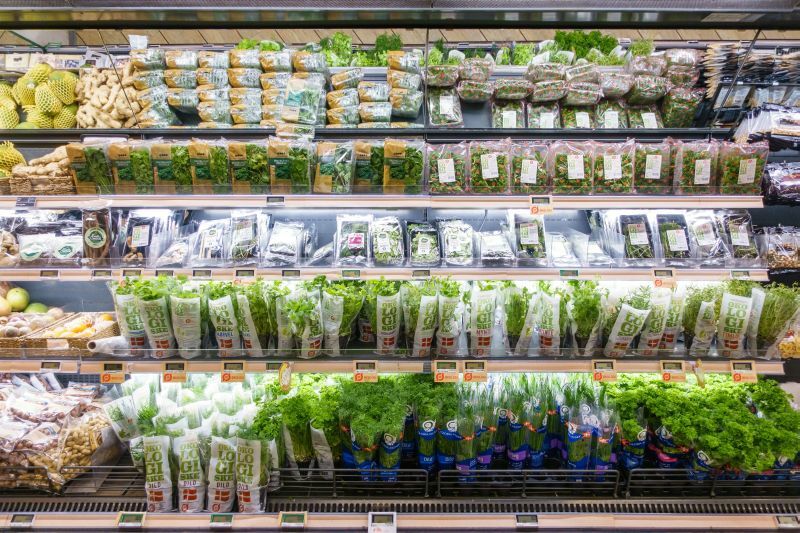 This starts with fresh produce such as fruit and vegetables, but unpackaged stations for popular dry goods such as mueslis, rice or noodles are also conceivable. It is important that the unpacked assortment is not limited in price to luxury goods and customers with purchasing power, but also includes popular basic everyday products.” The drugstore chain dm, for example, tests filling stations for dishwashing detergents and washing powder, but only in Austria. Alnatura is also starting up: “We are currently examining whether we can offer an unpackaged assortment. Because this requires major investments, we will first carry out tests in individual stores,” says Isabell Kuhl. Other than when it comes to packaging design, especially when it comes to their own brands, supermarkets and discounters have some scope. The new Packaging Act has increased the recycling rate. It is to rise from 36% to 63% for plastics by 2022 and as much as 90% for metals, paper and glass. A central body should make it more difficult for food manufacturers to circumvent the licensing of packaging. In future, the level of licence fees should be more closely geared to the actual recyclability of packaging. How well the recycling of plastics currently works and what the waste management industry could do, can be read in the next issue. DeutscheUmwelthilfe (DUH) (2015): Einweg-Plastik kommt nicht in die Tüte!